The following post is part of our series called “Your New Life in Yucatan.” Although this article is written from a perspective of a US expat living in Merida, Yucatan this topic should be read by people looking to live in any part of Mexico- especially if you view signing your signature as a mundane task you don’t really think about all that much. To read other articles about living in Yucatan please click here. If you have an artistic signature like this one you better practice it in Mexico. It should be the same each and every time! I once went to a local doctor who wrote her signature on my prescription with, and I am not exaggerating, fifteen loops to represent one “O” in her last name. When I asked her about why she did this she simply replied that it is her “style.” This was early in my residency here in Mexico. 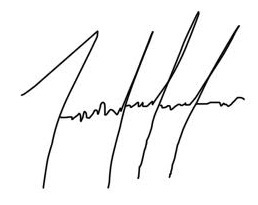 Since that day I began to look at signatures from friends and business associates and realized that a very stylized and perfectly replicated signature is a common phenomenon. Some signed on a forty five degree angle perfectly every time and some put letters within letters. Some added a perfect oval around their name while others underlined their name with the exact same strokes every time they signed. It made me feel like these folks were creating a perfectly replicatible symbol for their signatures rather than an easily readable sequence of letters I was used to back home in the US. This is when I realized that the concept of signatures here in Mexico is a little different than I am used to. If you move to Mexico from the US or Canada you are likely used to signing your name to identify yourself many times daily. This is especially true when it comes to purchasing small and large items at retail outlets. More and more people have become used to paying things with their debt cards instead of using cash. This may change in the US as banks are toying with the idea of charging fees for debt card transactions- using cash may become the norm again soon. Still- the concept of a signature as an identification has become somewhat “passé.” Think about it- how many times are you stopped in the US or Canada to accurately validate your signature at retail outlets beyond a glance at the back of the card or an occasional request for ID? If you happen to be one of those people who sign their name exactly the same every time with one hundred percent accuracy this posting may not be for you. If you are among the rest of us who “try” to sign the same every time but don’t really pay attention you need to read on. I call this one the "Heart Monitor" style signature. If you skip a "beat" or two you might be in trouble down in Mexico. For some who move to Mexico from another country the thought of a signature as a concrete identification is not fully understood. This can pose some challenges. From your immigration paperwork to bank transactions it is expected that your signature looks exactly as it does on your passport. There are times when your signature will not be accepted if it does not match. If you don’t believe this fact try standing behind someone at a busy retail outlet who attempts to pay with a check. The ten minute process of validating all aspects of the check including signature will prove this to be true- including the occasional call for another employee to offer their advice as to the acceptability of the document. There are many reasons behind this phenomenon. Some may call it attention to detail. I call it protection- for you and for others. There have been many advancements in technology that Mexico has embraced over the years including using credit/debt cards at an increasing number of stores, restaurants and service providers. The challenge is that signatures remain the only concrete validation of identity used in conjunction with a Federal Election ID card for Mexican citizens. In every legal interaction or non-cash exchange of money the use of an ID and exact verification of the signature confirms that people are who they say they are. If there is no match the process comes to a screeching halt. This is not a huge problem when you are buying groceries but can pose a big problem when signing legal paperwork. The moral of the story here is that, if you happen to be one of those folks who is used to signing your signature while looking at something else just to move on with your day, you will find yourself in a tricky situation in Mexico. My advice if you are one of many who don’t focus on your signature (I was one of them)- look at your passport closely. Take some time with a piece of paper and a pen and practice your signature. It may seem foolish but it is important. If the process seems too silly to handle you just need to channel your inner school child and remember what it was like to practice what your “grown up” signature would look like someday. Just make sure your last name is correct- I am saying this to all those ladies out there who might be tempted to add “Pitt” or “Clooney” as their last name. This would defeat the purpose. Have you had problems validating your identity in Mexico with your signature? Maybe you have a funny story to share. Please feel free to let us know about your experiences here or on our Facebook page or Twitter feed.